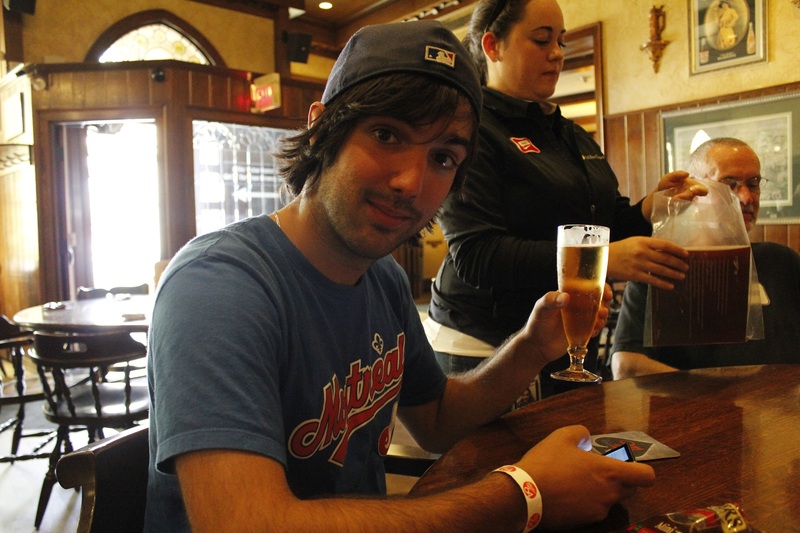 After the game in Milwaukee, we stayed in the area because we wanted to visit the famous beer brewery: Miller. 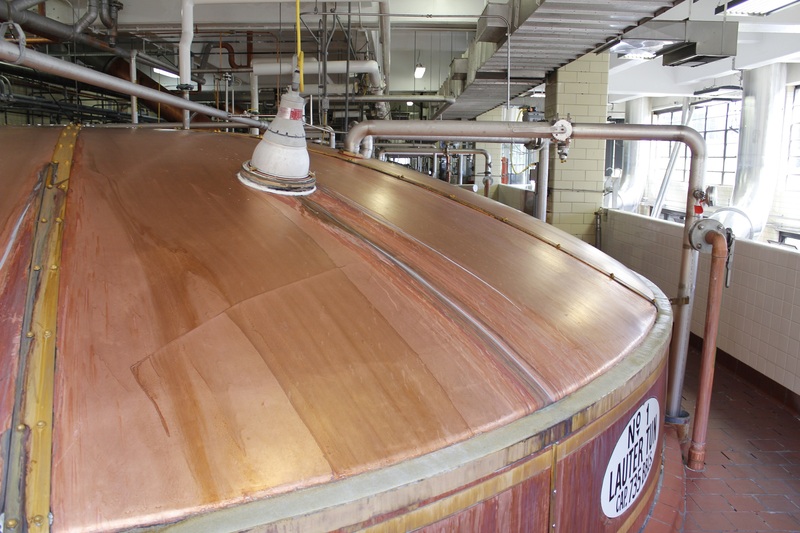 Like we already explain, brewery tours are very fun, interesting and also low budget because most of the time it is free or not expensive at all. Around 5h30 in the morning, we got a little surprise… we got awake by a cop of the Milwaukee police department. He told us that sleeping overnight was not allowed and that unfortunately we had to leave. Even the truckers sleeping around us were asking to leave. So, while the sun was coming up, we left the Wal-Mart parking lot for a McDonald’s were I decided to finish my report about the Miller Park before our 10h30 brewery tour. 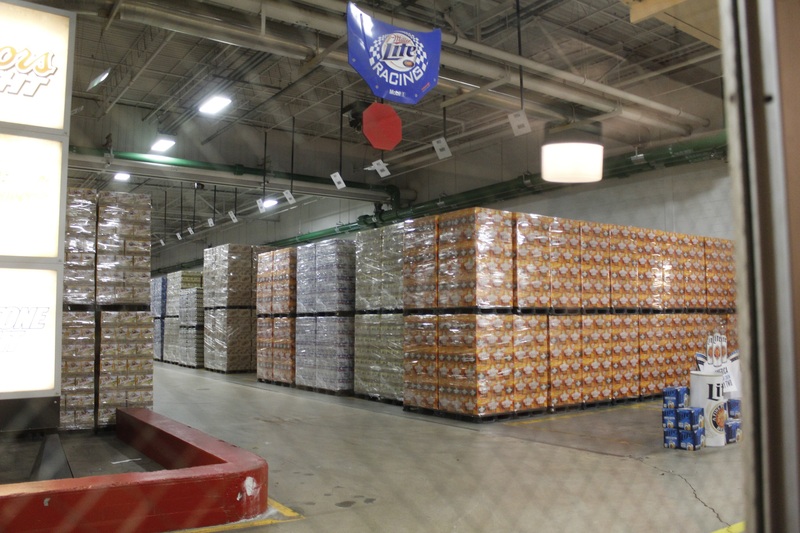 Like we told you in our last report about the Brewers, Milwaukee is the home town of the popular American beer: Miller. This brewery is working in partnership with Coors, another popular beer that you probably know and that we visited in Golden, Colorado earlier this month. Also, Miller is own today by a company called SAB Miller (South African Brewery). Miller was created in 1855 by a German immigrant who traveled across the United State to find the perfect land to brew is beer. He found it in Milwaukee because there was plenty of water. Like the other breweries, Miller survived the American prohibition by producing non-alcoholic beverages like Soda. 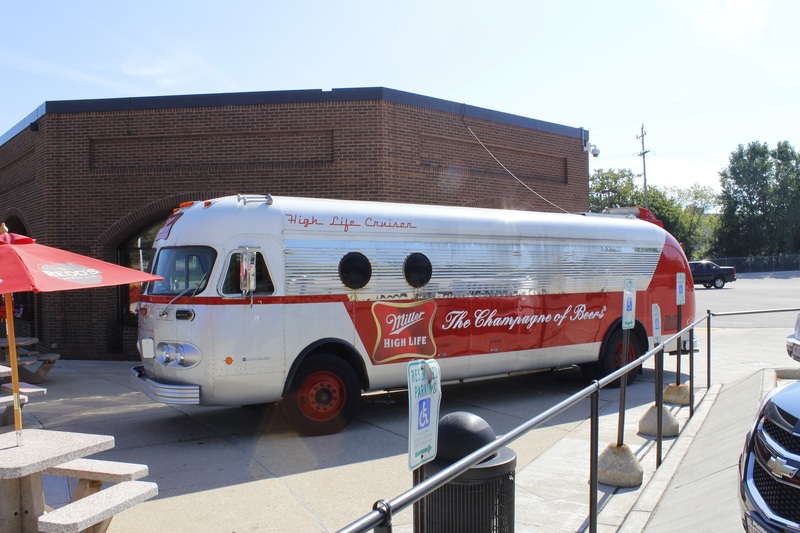 Miller is well known for the creation of the lite beer: Miller Lite. This beer is so popular that it represents 50% of the production of the brewery. Also, 40% of the production is going in Chicago.They are their biggest Miler consumers. 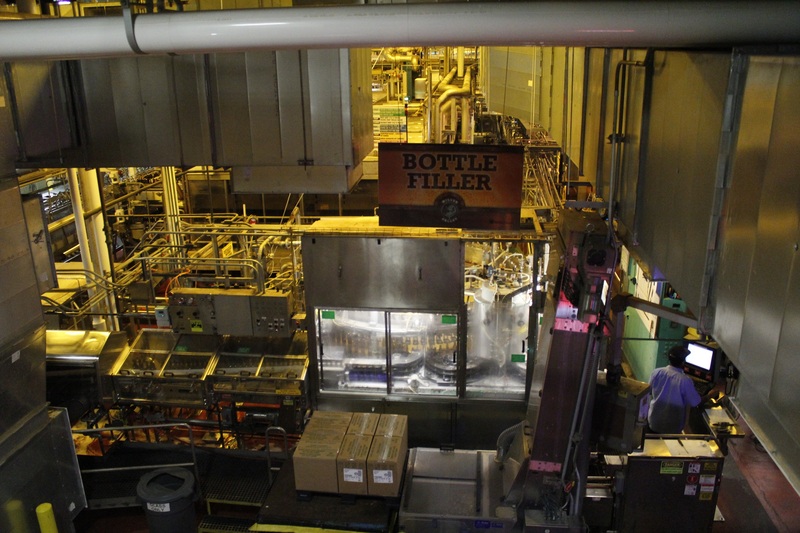 We visited the bottling line, the brew houses and the shipping dock. 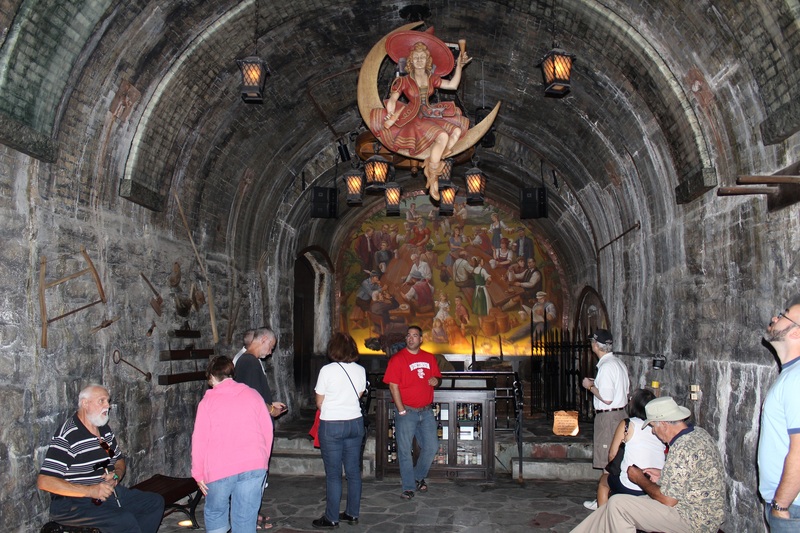 At the end, we visited the old underground caves were the beer barrels were kept by first brewer Frederick Miller and we finish the tour by a beer tasting in the bar at the Miller Inn. Well… we have to admit that it is not a tasteful beer… But it is very refreshing and it was free! 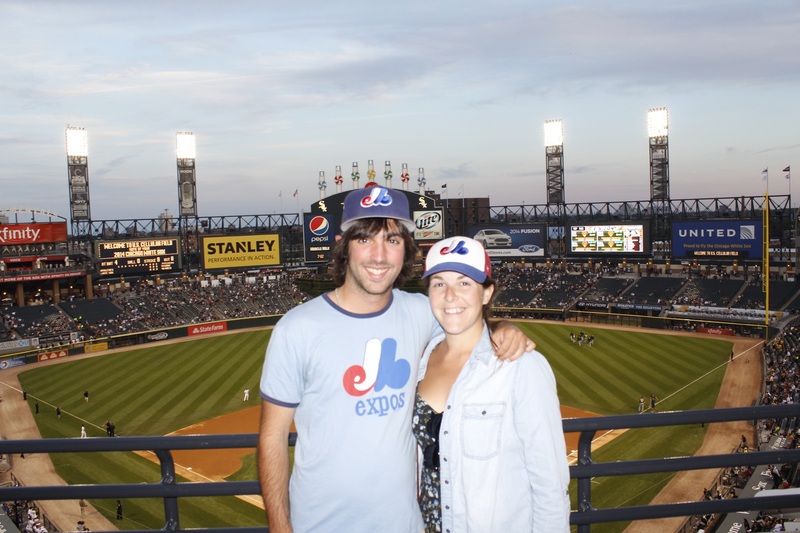 After the tasting, we left Milwaukee to be on time at the White Sox game in Chicago! Don’t worry Milwaukee and Chicago are at less than a two hour drive of each other. We took our time and we have to say that we were very happy because we took a hotel room to relax, take a shower and have a good night sleep. Like New-York, Chicago has two baseball teams: the Cubs and the White Sox. Tonight, we are visiting the White Sox but we have to come back next week for the Cubs because they are not at home for the next few days. We get to the ballpark pretty early (again, we saw a little bit of tailgating) because the team was giving away White Sox t-shirts. After the all-star break, the organization of the team figured that the team was not strong enough to get to the Post Seasons this year so to make sure that the team fans kept on going to the games they schedule a lot of new giveaways date. For example, every Monday home game of the season is now t-shirt giveaways. We love these kinds of things so we were VERY happy and we think it is also very nice for the fans! It was a “Bark at the Park “day (bring your dog to the game).Every fan who wanted to bring his dog to the game was allowed to and they were also having a reserve area in the Ballpark behind center field with a lot of goodies: food sample for dogs, water station and area for their personal special needs (if you see what I mean..). Well it was a very pet friendly night and they seemed to really enjoy it! Like usual, we visited the park before the beginning of the game. On the main concourse, we loved that there was a lot of place for the pedestrians. 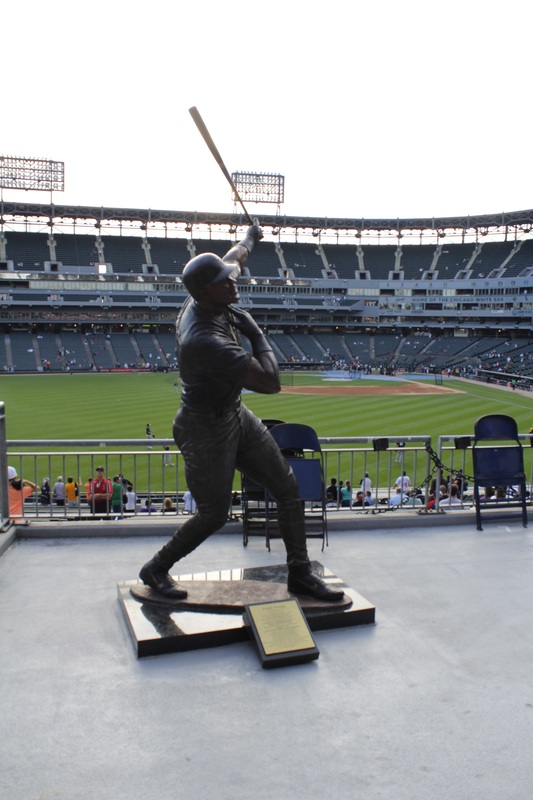 We find also statues of players or members of the White Sox organization. From the ballpark, we can go across the street to visit the major team store. This two floor store sale a lot of Chicago sport teams products like the White Sox, Bulls, Bears, Blackhawks and Fire (nothing of the Cubs of course). Walking near home plate on the upper deck you can get a pretty nice view of downtown Chicago. If you look around the U.S. Cellular you can find two blue seats surrounded by all the other green seats of the ballpark. Precisely, the blue seats were the first ones installed in the park in 1991. Also, the two seats are there as a souvenir of the two homeruns who gave the victory to the White Sox during the 2005 World Series! 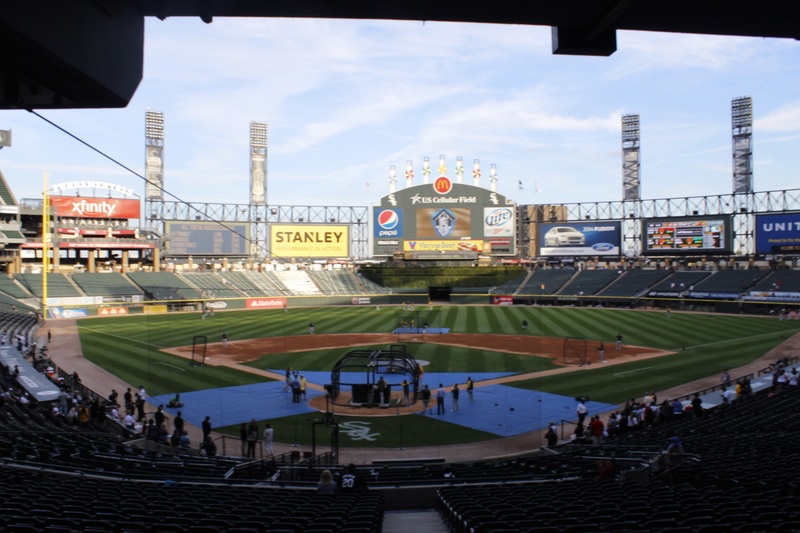 When the White Sox left the old Comiskey Park, it was the oldest stadium where the teams could play at the time (now this title is honored by the Fenway Park). The White Sox kept a few of the old ballpark structure. For example, you can find the first home plate if you walk in the main parking lot and the reproduction the former “exploding board” behind center field. These are colored wheels spinning and where fireworks come out when the team wins of when a player hit a homerun. Unfortunately, because it was a pet friendly night we did not have the chance to see any of this. Finally, you can find a shower to refresh yourself on hot days. The shower was built in memory of the one in the old Comiskey Park also to refresh the fans back in the days. 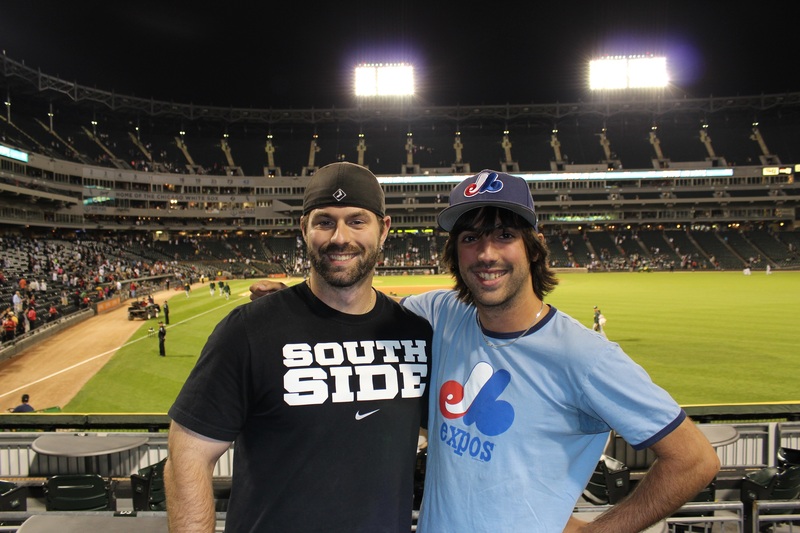 We were lucky enough to meet an official White Sox fan: Steve. He sat with us during the game and we talked a lot about the team organization. Our first question was: are the rumors are true about the neighborhood surrounding the field? According to him, this was true 15-25 years ago. Today, Chicago is still known to be murder capital of the United States but we do not have to worry when we are around U.S. Cellular field. 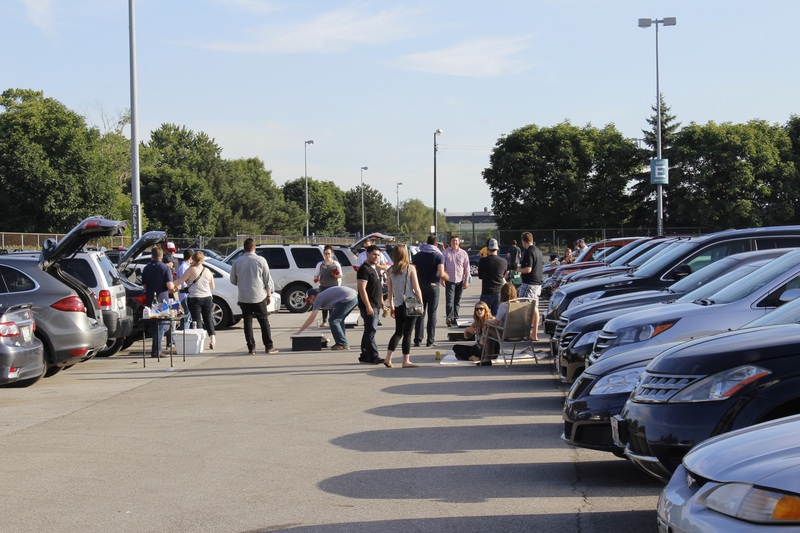 The surrounding neighborhood became industrial and most of the fans, like us, are coming to the games by car and are using the parking lot next to the ballpark. We didn’t felt uncomfortable last night in the ‘’south side’’. Talking about the White Sox, Steve told us that 2005 was the year that really helped dragging a lot of fans to the ballpark. He also told us about the famous ‘’blackout’’ game. 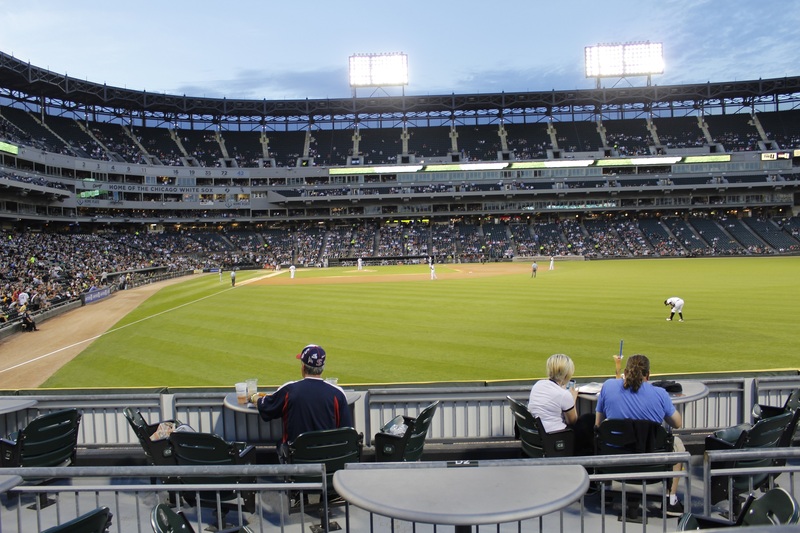 In 2008, the White Sox played a tie breaker game against the Twins at US Cellular Field. All the White Sox fans wore black to the game and the Sox won the game to head into post season. After 2005, the number of fans at the ballpark topped and then started heading slowly down. The team only went to post seasons only once since the 2005 World Series win. They also are having a tough year this season so fans didn’t came in big number to the game last night. Steve also told us about the ballpark. Built in 1991, it is the last one before the ‘’neo-classical’’ ballpark generation. It was partly inspired by Kauffman Stadium in Kansas City. 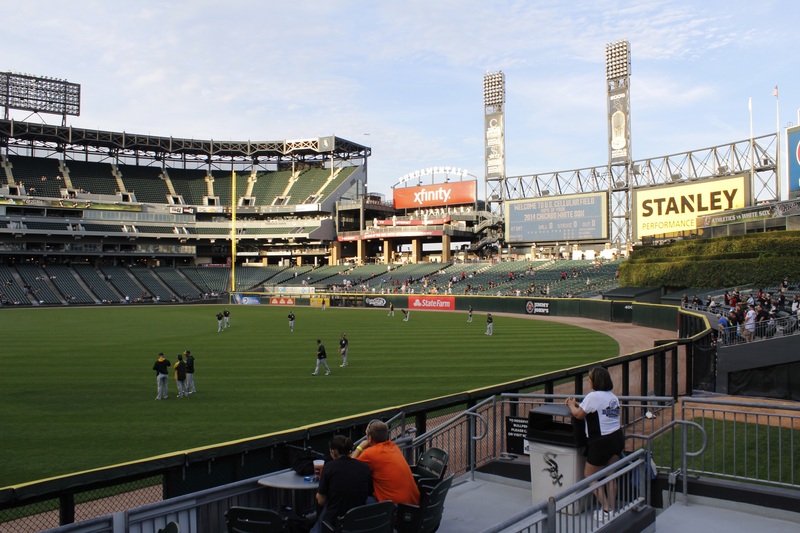 By trying to keep certain aspect of the old Comiskey Park while being modern and innovating, they committed a few mistakes on the way. For example, the grand stands seats were way too high. The team had to invest in a series of renovations to remain to these problems. The way they built the stadium was so no one had an obstructed view in the ballpark. In these many renovations, they moved the field walls so they are not perfectly flowing: this gives more exciting plays (bouncing balls, triples possibility, etc.). The ballpark is known to be batters friendly: we’ll mention it later! Thanks to Steve for giving us all these information, he is a real baseball fan! For the game, we were seated in the right field bleachers: 1st row (well right behind the right field restaurant which is technically first row!). The White Sox designated Hector Noesi to the mound and the Oakland Athletics were opposing him Sonny Gray. The White Sox had a good start: on a Brandon Moss’s fielding error, Adam Eaton scored the first run an Alexei Ramirez will score on a sacrifice fly: 2-0 White Sox in the 1st inning. After that, the game got off to slow rhythm: few hits and a lot of grounders. In the 5th inning, we got brutally woke up by a Josh Reddick home run ball that landed a few meters in front of us! One man was on bases and it’s a tie game 2-2. The next batter, Jed Lowrie, swing to the first pitch and the ball landed again a few meter from us! A’s took the lead 3-2 and we can say that, after that, everytime a lefty was coming to the mound we were ready with our gloves to catch a ball! In the 6th inning, Connor Gillaspie would bring everyone back to a tie with a solo home run… again in our section! Tough luck we couldn’t get any of these home run balls! The game fell again to a slow rhythm. On the other side we can say we say some of the best catches of our tour so far! Sam Fuld got 2: a great diving catch and a leaping catch to the left field wall. Michael Taylor got one great diving catch for the White Sox that got the fans on their feet. With runners on the corners in the top of the 8th inning, they were would successfully get a sacrifice bunt for one run: 4-3. People tough it was all over for the White Sox. In the top of the 9th, with runners on the corner again for the A’s, the White Sox called to the mound Ronald Belisario. We saw something weird happening: fans booed their own player! Steve, next to us, shook his head and told us that Belisario was not having a good year and he was not a crowd’s favorite! White Sox are having a bad record and their fans showed them they were not happy about it. A player was booed earlier when he didn’t reach for a fly ball. Belisario would do the job forcing the A’s to hit in a double play. Bottom of the 9th, Eric O’Flaherty was the pitcher for the A’S. With 2 outs and 2 strikes and no player on bases, the White Sox were down to Tyler Flowers. He would smash the ball to left field for a Home run and to tie the game! We got free baseball again! 10th, 11th, 12th, fans were slowly leaving the ballpark; we have to say it was a Monday night! In the 12th inning, Tyler Flowers would be at bat again and would smash the ball again to left field for a walk off win: 5-4 White Sox! We left the ballpark with a few ideas in our head. First, the White Sox have a great baseball heritage and fans that love the game. Yes we know US Cellular Field is not Wrigley Field but we can confirm that the visit there is a good experience. 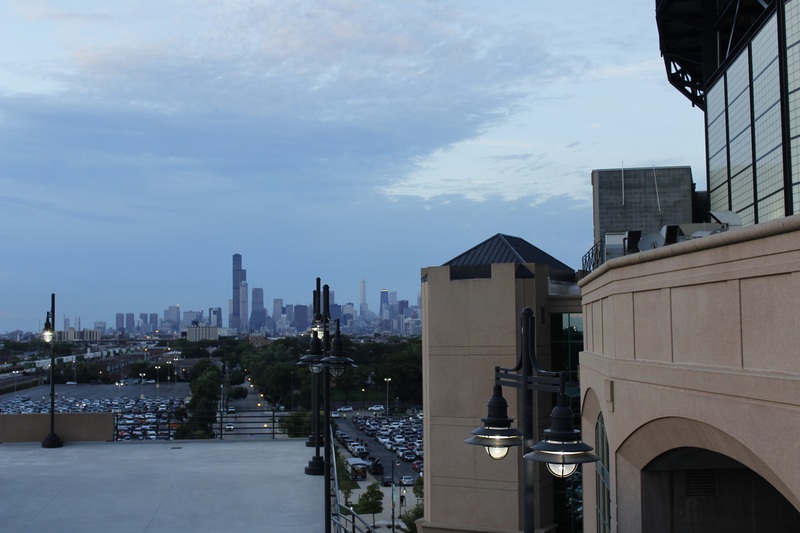 Second, we understood that the ballparks that were built after US Cellular field took example on it: they kept the good idea and left the bad choices. In Montreal, we have to be conscious of what is working out good for the recent ballparks like Target Field. Finally, the White Sox fans are great fans. They have a great rivalry with the Cubs when they play Inter Leagues. We saw them give a piece of their mind to the Athletics fans that were a little bit too rowdy at the game (let’s say we tough they were annoying). Let’s say we couldn’t hear them after the second Flowers Home run! Thanks to Steve for talking with us! He told us that he belived that, if the 1994 season had happened, the White Sox would’ve beat the Expos in the World Series! White Sox were also first of their division when the season was cancelled. We are leaving Chicago towards Louisville! P.S. 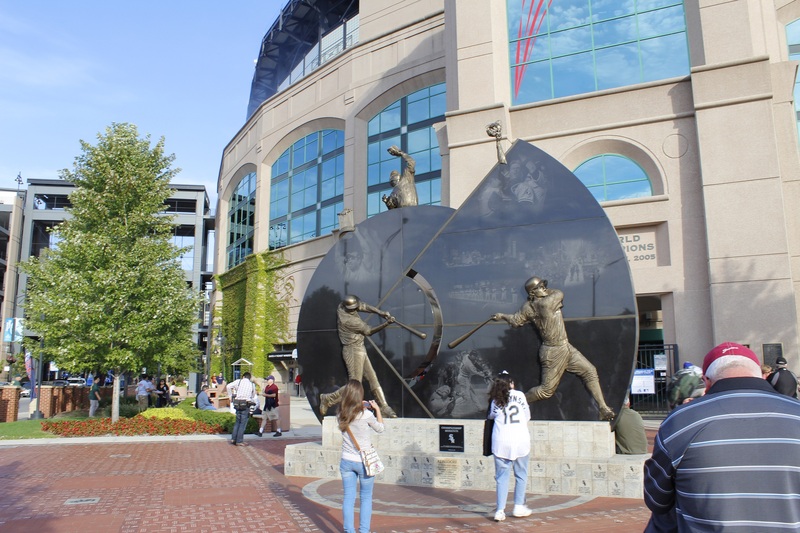 Did you know that, when the ballpark opened in 1991, it kept the name Comiskey Park for a few years before U.S. Cellular field bought the naming rights?